What is the POW Investigative Project (PIP)? An investigative reporting and global crowdsourcing platform designed to help solve one of the most controversial and enduring mysteries in American history: What happened to US prisoners-of-war and missing-in-action servicemen who were last reported in communist captivity but never returned after the Korean, Cold and Vietnam Wars? The POW Investigative Project, Inc. is a non-profit company. Doesn’t the Pentagon solve these cases? 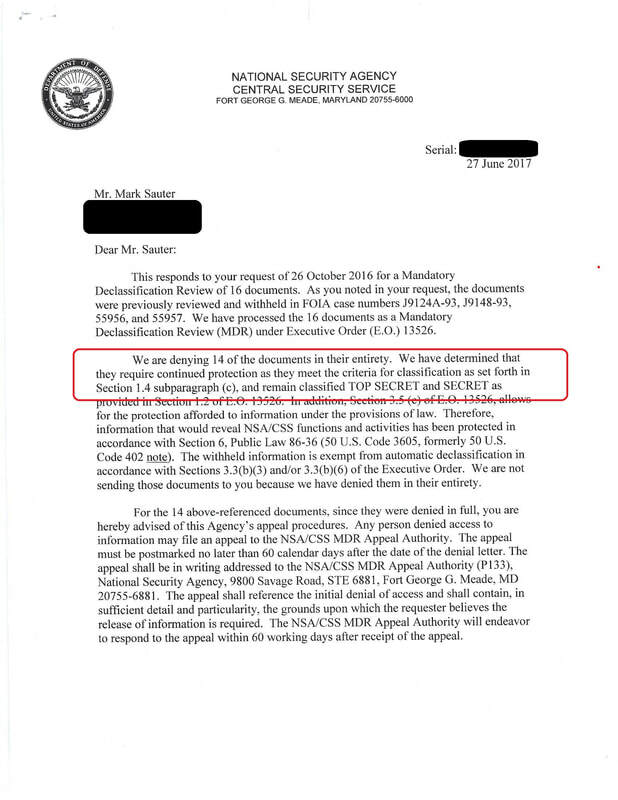 After years of scandals involving the Pentagon POW/MIA office (now renamed the Defense POW/MIA Accounting Agency, or DPAA), Congress demanded the organization dramatically increase the number of POW/MIA remains it identifies each year. The office now largely focuses on identifying remains stored in its labs for years, from sources such as Pearl Harbor ships and remains provided by the North Koreans (for money) many years ago. The PIP believes identifying these remains is a crucial, high-priority task, as is recovering the remains of as many other missing Americans as feasible. The vast majority of POW/MIAs died on the battlefield and their remains are now in US government labs, lost or unreachable at sea or on land, or held back by the North Korean, Vietnamese and other governments. Who runs and staffs the PIP? The Project includes award-winning investigative reporters, former government experts on POW/MIA and human rights issues and freelance reporters and researchers. Most importantly, the PIP relies on international online Contributors to send us information and help us solve Leads/Clues. Our president and former government experts are volunteers. How does the PIP work? We identify promising "Leads/Clues," including those we’ve found by forcing the declassification of US intelligence records, and showcase the profiles of "Missing Americans" for whom information is being sought. We believe answers to the fates of many missing Americans are “out there” in the records of foreign countries and evidence collected or known to former officials and even average citizens from nations where US POWs were held. We use multilingual crowdsourcing to try to reach the “people with the answers” and get information back. We also leverage the expertise of investigative reporters and freelancers to do targeted research on specific "Leads/Clues." We pay our freelancers. In addition, in some cases we offer our online Contributors research fees to find specific information on "Leads/Clues," such as documents, and to analyze and follow up data provided on the site. Why does the PIP exist? Aside from representing an enduring and controversial mystery and unsolved chapter of American history, the POW/MIA issue impacts families across our nation. Well over 9,000 servicemembers remain missing from the Korean, Cold and Vietnam Wars. Many of their families are seeking answers on their fates. We hope we can provide some of those answers. Could any of these POWs remain alive? We don’t know. The Pentagon and US intelligence community have the most updated information on this question, but keep critical information classified. As noted in the “Leads/Clues” and Missing” profiles on this site, there is substantial evidence that some Americans were captured and secretly held after the Korean, Cold and Vietnam Wars. 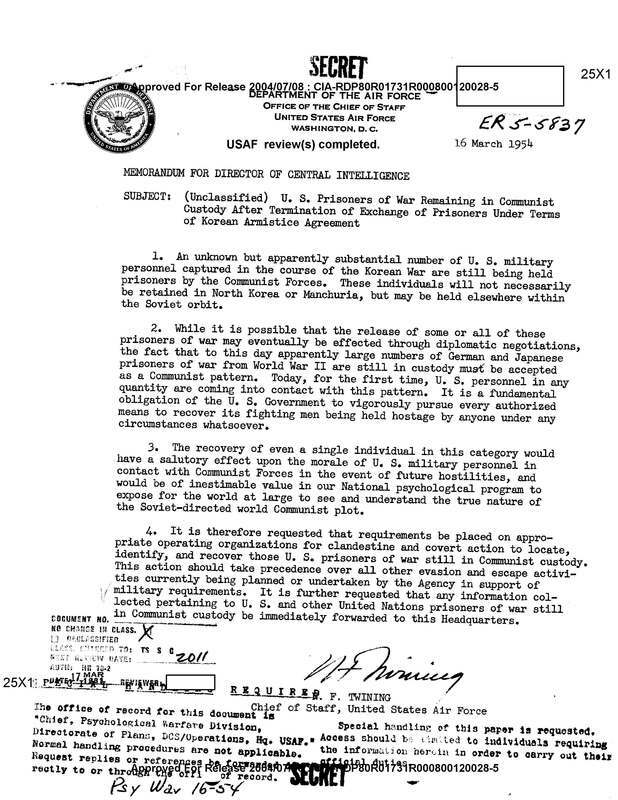 For example, the year after the Korean War ended, the US Air Force Chief of Staff requested covert CIA action a year after the war to recover an “apparently substantial number of U. S. military personnel captured in the course of the Korean War (who) are still being held prisoners by the Communist Forces” (see the document above). 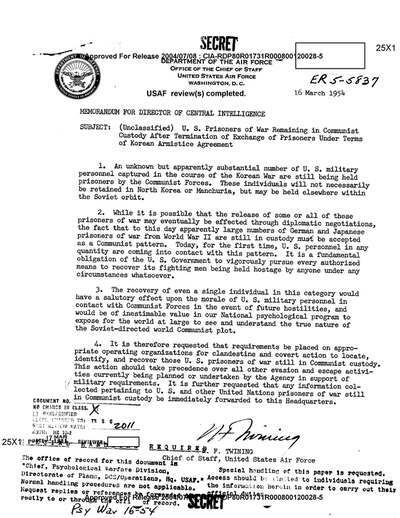 The State Department informed Moscow during the Cold War that the US was “compelled to believe” some American aviators were secretly imprisoned by the USSR. In 1993, the US Senate Select Committee on POW/MIA Affairs concluded there was no proof US POWs remained alive in Southeast Asia. However, it noted: “We acknowledge that there is no proof that U.S. POWs survived, but neither is there proof that all of those who did not return had died. There is evidence, moreover, that indicates the possibility of survival, at least for a small number, after Operation Homecoming.” A number of Senators and committee investigators concluded that Hanoi had indeed retained a number of US prisoners after the war, likely including both those held for intelligence or hostage purposes and Americans who, under at least some level of duress, had accepted communism and become Vietnamese citizen. There are reports, including some released after the Senate investigation, of such Americans reported alive years and even decades after they were supposed to be returned home from the Korean and Vietnam Wars. Such men would now be in their ‘60s to ‘90s. 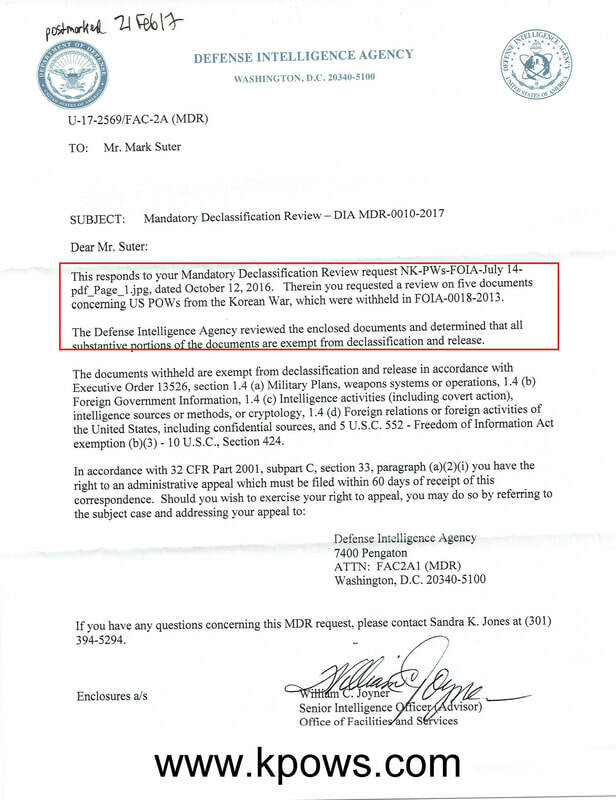 For example, defectors and declassified documents report US prisoners still alive in North Korea into the 1990s (Americans from both the Korean and Vietnam Wars have been reported in North Korea; Pyongyang sent fighter pilots and other personnel to Vietnam to help Hanoi fight America in that conflict.) Some 500 South Korean POWs, captured at the same time as American POW/MIAs in the Korean War, were believed still alive by the South Korean government in its last report on the topic. Some even escaped North Korea in 1990s and, reportedly, after. If South Korean prisoners survived, could Americans? It's also worth noting that reports indicate American prisoners, especially in North Korea and Vietnam, may have had families. 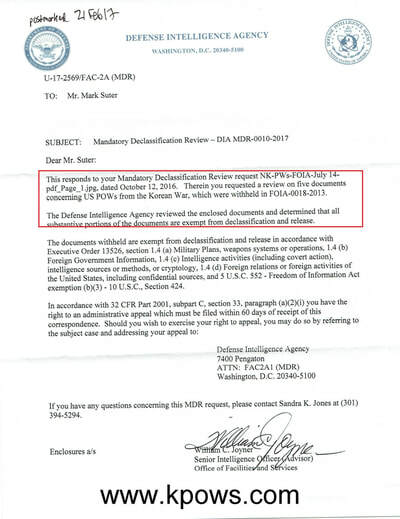 The PIP is interested in learning whether these reports are true and, if so, making contact with the children of American POW/MIAs, even if the Americans are now deceased. The PIP does not assume that any POW/MIAs remain alive, or that all have perished. Either way, the answers we seek are important to the families of the missing and to resolving key questions about the POW/MIA controversy. Please contact us with any questions or suggestions.